This page contains information and pictures about Jewel Beetles that we found in the Brisbane area, Queensland, Australia. 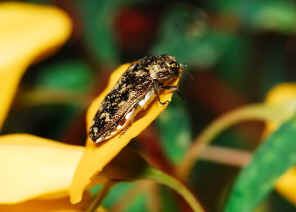 Jewel Beetles are active in hot weather and will readily fly in sunlight. Jewel Beetles can normally be seen feeding nectar on flowers in bush during a sunny day. 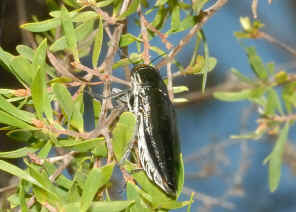 Some Jewel Beetles are leaves feeder. They ranged from very small to very large size. 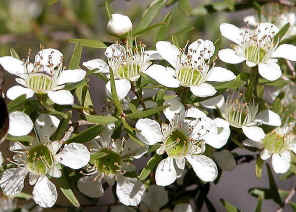 Their body is elongated and flattened. 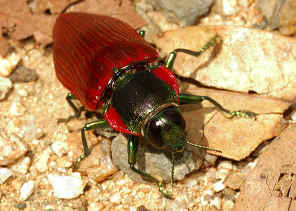 They are brightly coloured and often have a metallic sheen which make their common name Jewel Beetles. They are active and ready to fly during daytime. 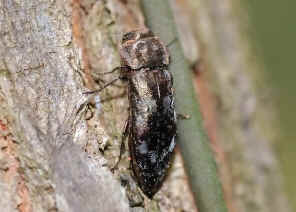 Most species of Jewel Beetle larvae live in wood, although some of them live in root and a few are leave miner. Most of them have very long life cycle. 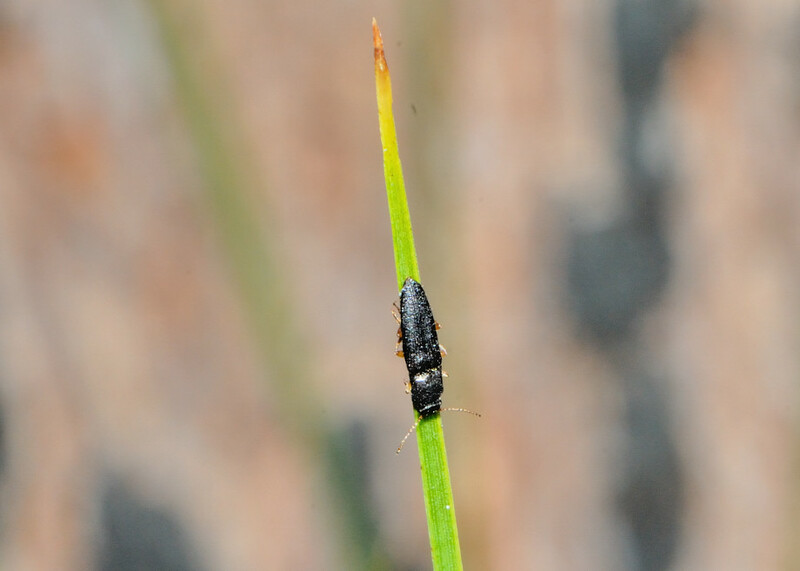 We found this beetle in Karawatha Forest on She-oak trees. This is the largest beetle we ever saw. This Jewel Beetle is very colourful and the colours are highly variable. They can be yellow to dark red. 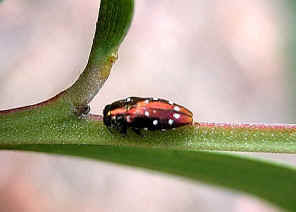 Some individuals may have red/yellow/green patterns on wing-covers. We have detail information and many pictures in this page. In Alexandra Hill during early summer, we found a lot of those orange-black Jewel Beetle feeding on white flowers of tea tree Leptospermum. The patterns on each beetle are slightly different. Their colours also vary from yellow to orange. Please check this page for more information. 1. 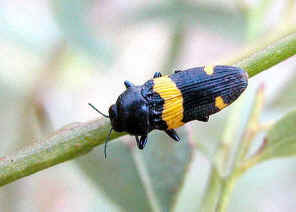 Castiarina decemmaculata (Kirby, 1818) - Australian Biological Resources Study, Department of the Environment, Water, Heritage and the Arts, 2001. 2. Specimen Image Index - Insect Reference Collection Database - ICDB, Western Australian Department of Agriculture, 2006. 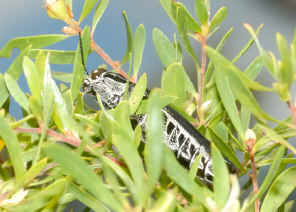 On Oct 2004 in White Hill, we found this Jewel Beetle alone on a young gum tree. Check this page for more information. 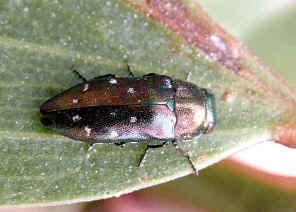 This small Jewel Beetle has the metallic blue wing-covers, golden green thorax and metallic black head. 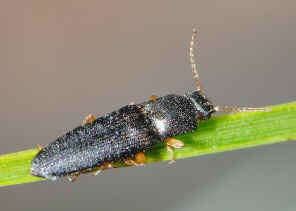 Its wing-covers have the saw-toothed edge, which is a unique feature among jewel beetles. We found this beetle once in Daisy Hill near Buhot Creek on mid summer Dec 2008. It was resting on leaves on the top of a short weed plant (correction: this plant is not a weed). More information and pictures please click on here. 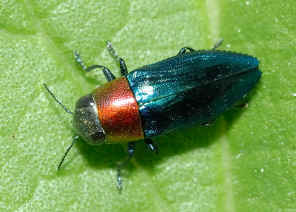 The jewel beetle is dark blue in colour. Its thorax and wing-covers is smooth and shiny. It has a pair of large eyes. 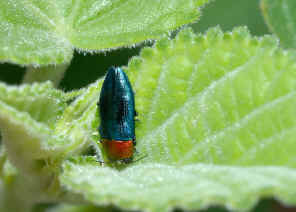 Its head, abdomen and legs are the same dark blue colours but covered with short white hairs. Please check this page for more information. 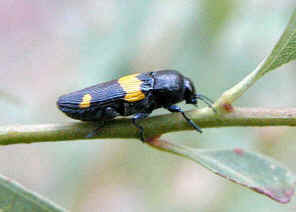 This small Jewel Beetle can easily be found on young Acacia trees in Alexandra Hill during mid summer. When disturbed, they dropped and flied away. 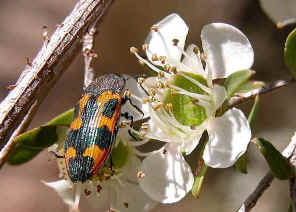 The beetle was metallic dark brown to dark green in colour with eight white dots forming a circle on its back. Please check this page for more information. 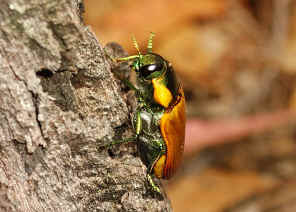 We found this jewel beetle once on a large Acacia tree trunk near Bulimba Creek on Mar 2008. The beetle was slowly climbing up the tree. More information and photos can be found in this page. 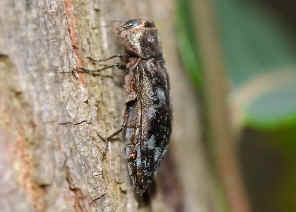 Found it jewel beetle in Daisy Hill on early summer Sep 2008. 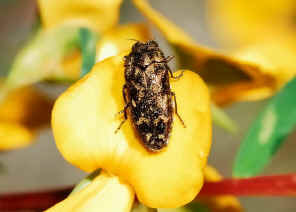 It was resting on yellow flowers of Wallum Wedge Pea (Gompholobium virgatum). Please check this page for more information. 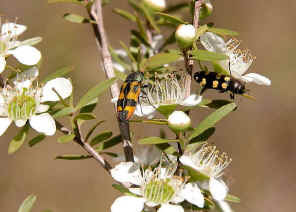 Jewel Beetles like to feed on Tea-tree flowers. Wherever there is the blooming Tea-tree flowers, get closer to have a look. 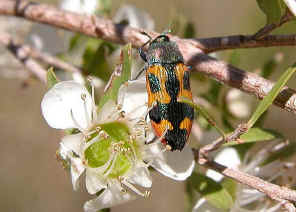 You may find different species of Jewel Beetles feeding on them. Here we would like to thank Mark Hanlon for sending us email on the IDs of the jewel beetles and correcting some of our errors on this page. 2. Insects of Australia, CSIRO, Division of Entomology, Melbourne University Press, 2nd Edition 1991, pp 632. 3. Insects of Australia and New Zealand - R. J. Tillyard, Angus & Robertson, Ltd, Sydney, 1926, p216. 4. 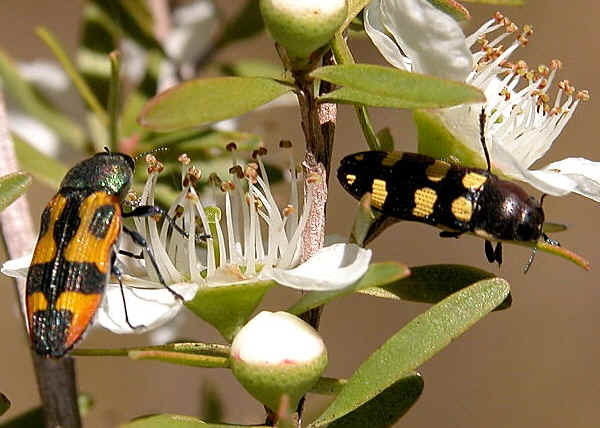 Jewel Beetles of Western Australia - K. Carnaby, Wilga WA, 1986. 5. BUPRESTIDAE Leach, 1815 - Australian Biological Resources Study, Department of the Environment, Water, Heritage and the Arts, 2001. 6. 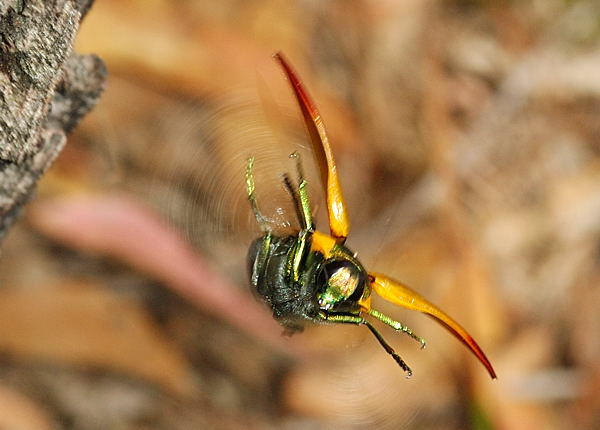 Beetles of South Australia, a guide to the Genera of, Part 4, E.G. Matthews, South Australia Museum, 1985.